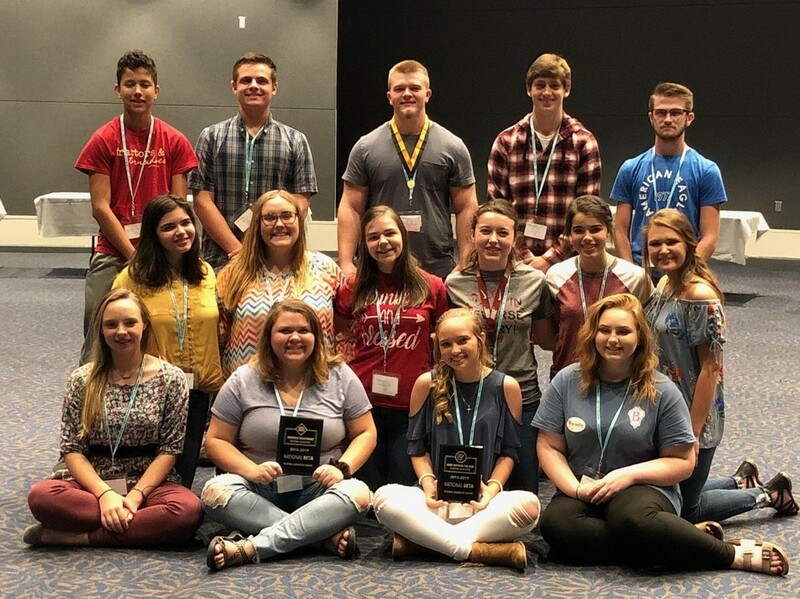 How did Beta Club members spend the first week of their Fall Break? On Monday night, they had an Up All Night fundraiser that raised $580 for Arkansas Children's Hospital Northwest. On Wednesday, several of them were at school for hours practicing the dance routine for their group talent for the state convention in January, or preparing a project board for another competition. Thursday morning, 15 members loaded on a small, hot bus and headed to Hot Springs for Arkansas Beta's Fall Leadership Summit. Thursday's agenda consisted of officer training for four chapter officers, a session with a motivational speaker, and then competitions. Destiny Smith, Lauren Ryan, and Hannah Green did a presentation about our fundraising efforts for Arkansas Children's Hospital Northwest in the category of Service Snapshot. The Rapid Response team of Hunter Thompson, Hannah Smith, Savannah Cessna, Ethan Staton, Tayleigh McConnell, and Emily Smith competed in a Time Traveler challenge. Matthew Wood was interviewed and put through a series of challenges as he vied to become one of Arkansas's Leadership Representatives. Gathered in the sponsors' hotel room, the Lead Outside the Box team consisting of Emily Staton, Sam Duvall, Jesse Witt, and Kelsey Krigbaum, assisted by Levi Wright, grappled with a challenge which asked them to come up with solutions for a school district that has lost tax revenues as local industries have moved away, has had state funding cut at the same time, and is facing having to cut programs as well as teaching positions. On Friday morning, the Lead Outside the Box team gave their presentation, all of the members attended another session with another motivational speaker, and then it was time for awards! Besides receiving a chapter award for being a Leadership School, Magazine's Betas also brought home national qualifying plaques for Service Snapshot and Lead Outside the Box, and Matthew Wood was selected as one of Arkansas's three Leadership Representatives and has the opportunity to compete to be one of three national Leadership Representatives. So, how did YOU spend the first week of Fall Break?